Steve Kerr described the Golden State Warriors' record-breaking 51-point first quarter against the Denver Nuggets as "a fireworks show". 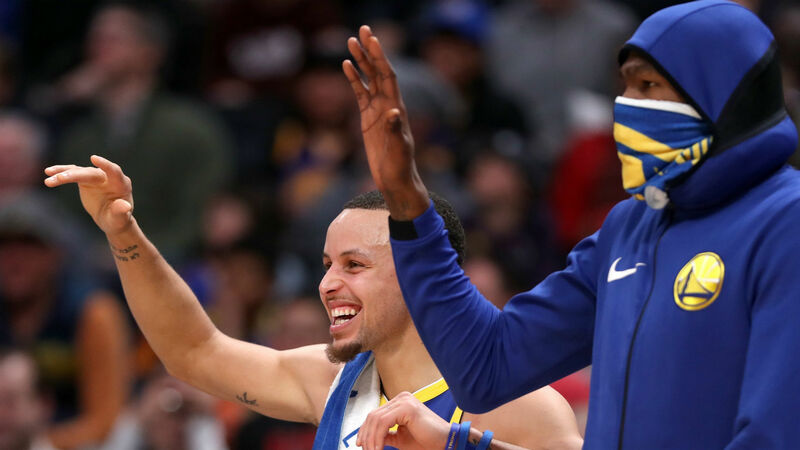 The defending NBA champions claimed a fifth straight win in style on Tuesday as they thumped the Nuggets, who had previously been atop the Western Conference, 142-111 on the road. Not only were their 51 first-quarter points an NBA record, but the 10 three-pointers they made in the opening period set a franchise record for field goals from beyond the arc in a quarter. They now lead the West by half a game from the Nuggets, leaving head coach Kerr to revel in an utterly stunning start to the contest. It is a particularly ominous time for the Warriors to be finding form, with Golden State poised to add All-Star center DeMarcus Cousins, whom they signed to a one-year deal in the offseason, to the mix against the Los Angeles Clippers on Friday. Cousins has been out with an Achilles injury but his on-court debut gives the Warriors the option to field a starting five of All-Stars as he links up with Curry, Durant, Thompson and Draymond Green, who hopes his new team-mate's impact is as significant as expected. "We'll figure it out," Green said of working Cousins into the team. "It's not rocket science. It's basketball. We just got to play good basketball, which we will... adding [Cousins] to this team is amazing.